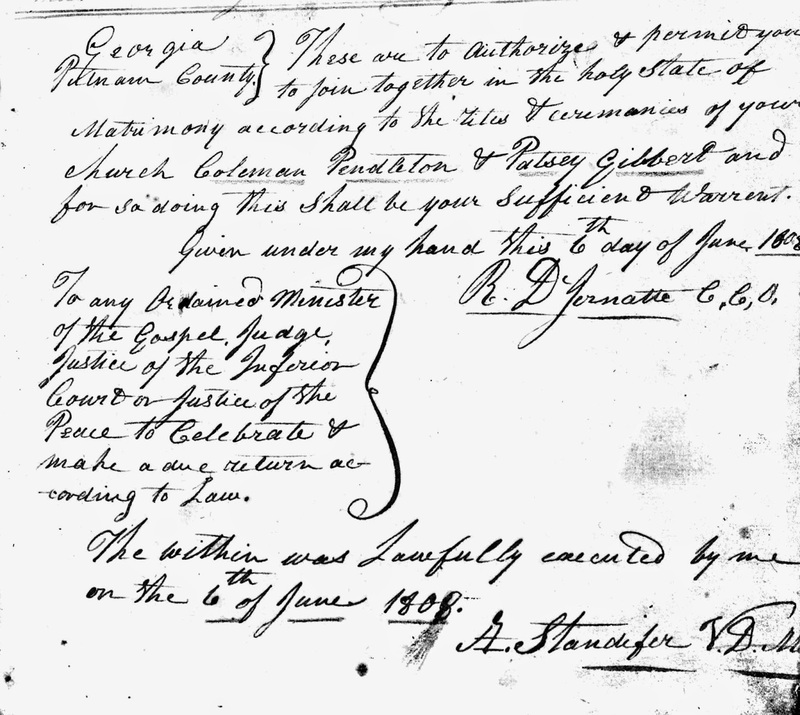 Patsy married Coleman Pendleton on June 6, 1808, in Putnam County, Georgia, when she was 19. Coleman had traveled to Georgia from Virginia as a missionary for the Christian Church, and he served as a chaplain during the War of 1812. Patsy gave birth to four children: Louisa Emily (b. 1809), William Robert (b. 1811), Philip Coleman (b. 1812, my 2nd great grandfather), and Edmund Monroe (b. 1815). 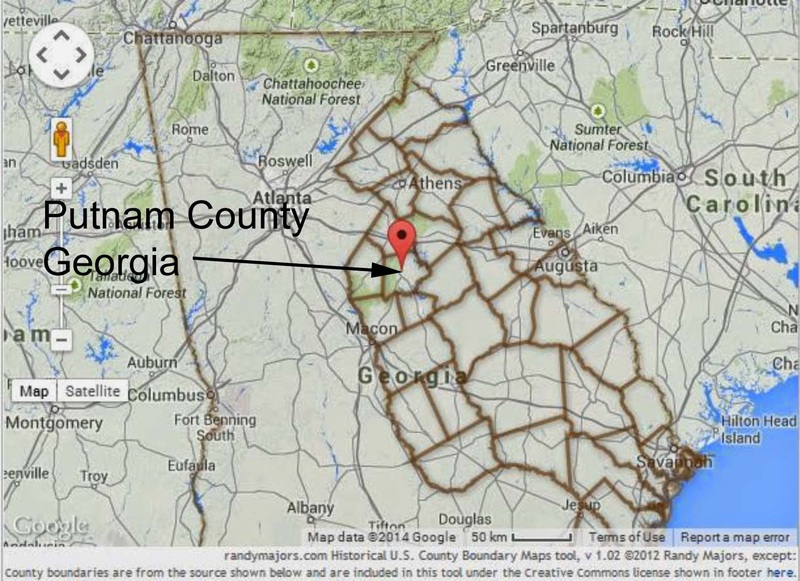 Patsy and Coleman stayed in Putnam County for about 17 years and then moved to a farm in Butts County, Georgia, "near the famous Indian Springs, about thirty miles from Macon." Native Americans were still living in this area at the time. By the 1840, U.S. census, Patsy and Coleman were living in Harris County, Georgia. Their son William Robert died in 1841 in Baker County, Georgia, leaving behind his wife Marion C. Jordan and young children. Their other two sons remained in Georgia the rest of their lives. Philip Coleman married Catharine Tebeau, and Edmund Monroe married Sarah Jane Thomas. On their 30-acre farm in Harris County, Patsy and Coleman had horses, cows, sheep, and pigs, and they grew wheat, corn, oats, peas and beans, and sweet potatoes. At the time of the 1860 U.S. census, Patsy and Coleman were living in Chambers County, Alabama, with their daughter Louisa Emily and her husband John J. Oliver who was a farmer. 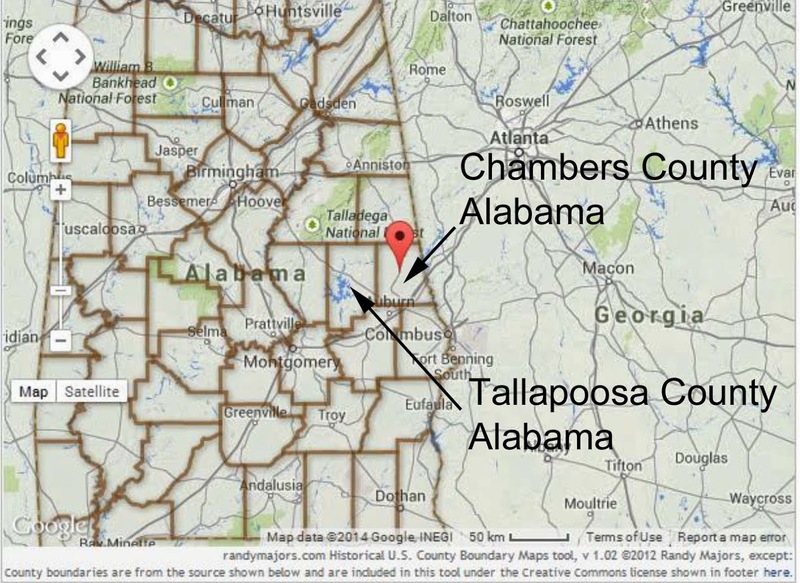 Sometime prior to the 1870 U.S. census, the Pendletons and Olivers moved to Tallapoosa County, Alabama. Patsy's husband Coleman died on May 31, 1862, in Tallapoosa. The 1870 U.S. census for Tallapoosa shows Patsy is living in her own household near the farms of her daughter Louisa Emily and son-in-law John Oliver and her grandson Philip Oliver. She lived another 12 years after Coleman and died on August 6, 1874 in Tallapoosa County. Ancestry.com. 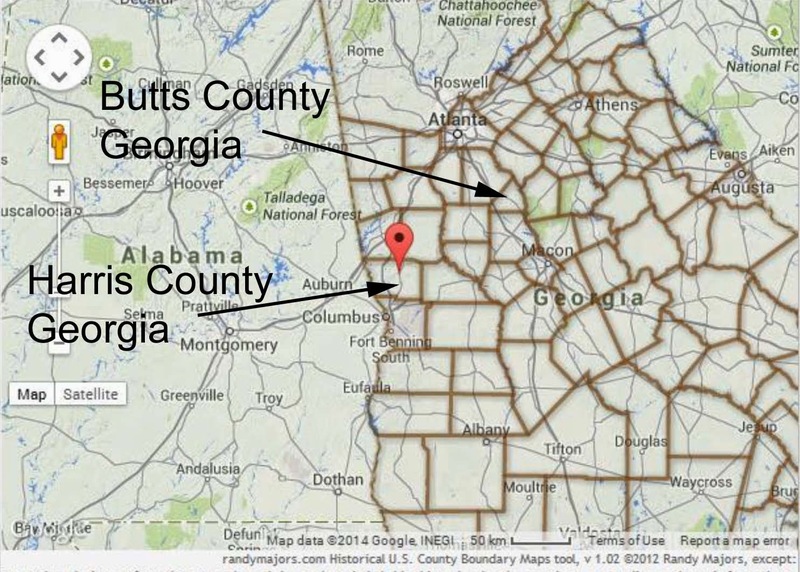 Georgia, Marriage Records from Select Counties 1828-1978. Marriage record for Patsy Gilbert and Coleman Pendleton. Constance Pendleton, ed., Confederate Memoirs: Early Life and Family History, William Frederic Pendleton and Mary Lawson Young Pendleton. (Bryn Athyn, Pennsylvania, 1958), 11. "1840 United States Federal Census," database, Ancestry.com (http://www.ancestry.com : accessed 30 June 2014), entry for Coleman Pendleton, Harris County, Georgia. 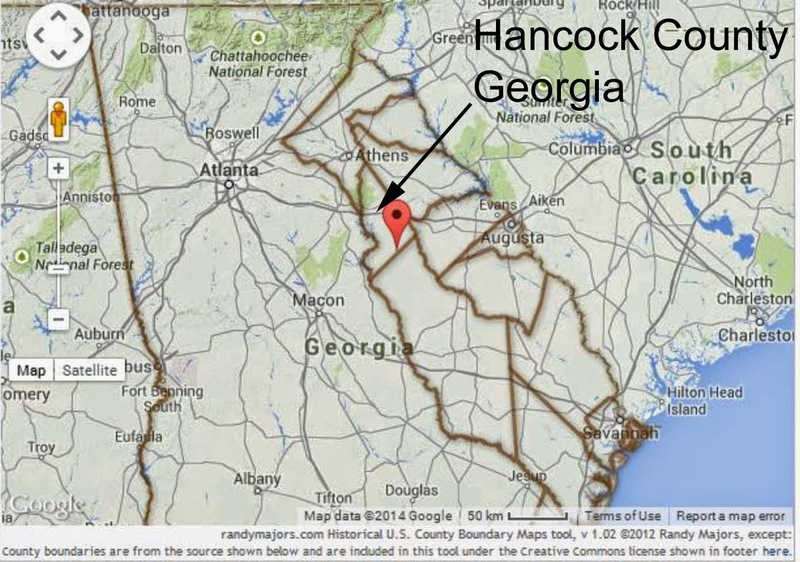 "1850 United States Federal Nonpopulation Schedule 1850-1880," database, Ancestry.com (http://www.ancestry.com : accessed 30 June 2014), entry for Coleman Pendleton, Harris County, Georgia. "1860 United States Federal Census," database, Ancestry.com (http://www.ancestry.com : accessed 30 June 2014), entry for Coleman Pendleton and John J. Oliver, Chambers County, Alabama. "1870 United States Federal Census," database, Ancestry.com (http://www.ancestry.com : accessed 30 June 2014), entry for Martha Pendleton, John J. Oliver, and Philip Oliver, Tallapoosa County, Alabama.